This beautiful pair of mandarin ducks will definitely jazz up spaces with interior designs that do not favour colorful motifs. The mandarin ducks are the strongest love magnet you will ever find. They always build together faithfulness and loyalty in their love relationship. Mandarin ducks have been used for centuries as the most traditional symbol of love in Feng Shui practice. The mandarin ducks signify love, romance, devotion, fidelity, affection and partner loyalty. 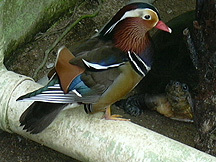 In real life, the mandarin ducks are always seen as loving pairs. Its motives are often used to help singles find new love partners and eventually leading to marital bliss. Add on a new pair of these lovely ducks (as many as you like) everytime you feel you are out of love, and it will definitely make you more loveable and attractive. The mandarin ducks can be displayed anywhere, be it in your office, bedroom, living room, dining room or even by your fish pond. This in turn will enhance your chances of finding your lifetime partner. What the Mandarin Ducks symbolize and how to place this object? The mandarin ducks have been used for centuries as the most traditional symbol of love in Feng Shui practice. The mandarin ducks signifies love, romance, devotion, fidelity, affection and partner loyalty. In real life, the mandarin ducks are always seen as loving pairs. The symbols are often used to help singles find love partners in love and eventually marital bliss. Placed nearby their owners, the Mandarin ducks emit strong love chi that makes them more loveable and attractive to enhance their chances of finding partners. The mandarin ducks (an earth element animal) are usually in a pair of male and female. 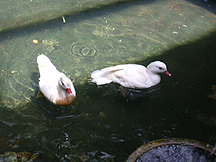 The male has more attractive tail in an upward direction, while the female does not. To generate the devotion in your partners, you may tie the necks of the pair with red string to signify "tying-the-knot" in your successful relationship. 1. The product is made of wood to activate Love Star# 4 in the practice of Flying Stars Feng Shui. Activating flying stars star #4 promises the fastest results. In 2010, Love Star #4 resides in the north.